Physiatry is the medical specialty responsible for overseeing the treatment of patients with a wide range of disabilities. Dr. Ed Harrison, a physiatrist, is the Director of Physical Medicine & Rehabilitation Services at the Queen Elizabeth Hospital in Charlottetown, where the Provincial Rehabilitation Unit (Unit 7) is located. This unit is a specialized, 20-bed unit, staffed by an interdisciplinary team including nursing, physicians, physiotherapy, occupational therapy, speech language pathology, prosthetic & orthotic services, dietitian, volunteer services, social work and psychology. Other services available in the Physical Medicine Department include a Seating Clinic and Wound Care Clinic. The daily routine on Unit 7 is geared towards helping the patient develop maximum independence in everyday tasks. The physiatrist and attending physician work with the interdisciplinary team to ensure the patient receives comprehensive coordinated care including medical care, therapy services, and other services necessary to enhance rehabilitation and recovery. 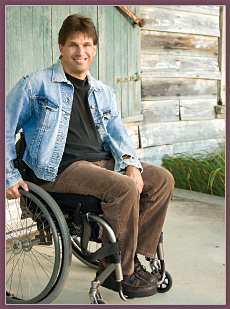 Rehabilitation nursing provides 24-hour comprehensive nursing care. Nursing works closely with patients and their support system/families to help them achieve a maximum level of independence. Patients with SCI will often be re-learning daily activities such as dressing and bathing, managing bladder and bowel routines, and learning how to care for their skin. Physiotherapists work with a patient with SCI on a range of exercises and activities designed to improve strength, balance, and range of motion. Occupational Therapists focus on assisting patients with SCI to relearn or modify life skills such as self-care activities, homemaking routines, and leisure/ community activities. Dietitians assess nutritional needs, plan for appropriate foods, and teach patients and their families/caregivers how to make changes to their diet. Social work, an essential part of the team-based approach to healing, provides patients and their families with counseling and assistance with practical problems. Recovery is often not the absence of illness, but the ability to cope with it. During the stay on Unit 7, patients may have various pieces of equipment assigned/loaned to them for the length of their stay. Depending on the needs of the patient this may include, for example, manual or power wheelchairs. The Occupational Therapist and/or Physiotherapist will recommend the type of equipment patients will need once they are discharged, and along with the social worker advocate for funding of the equipment. If further therapy is needed after discharge the therapist will make arrangements with patients to obtain services through outpatient or community-based services. Patients may be referred to out of province services when specific needs are identified for specialized services by the interdisciplinary team in consultation/collaboration with the patient/family or team. Examples are the IWK & Nova Scotia Rehab Centre in Halifax, the Stan Cassidy Rehabilitation Centre in Fredericton, or Lyndhurst Rehabilitation Centre in Toronto. Once a patient leaves the QEH, they and their families they and their families may continue to need counseling to move forward with the significant adjustments to their lifestyle. Couples can experience anxiety, depression, anger, fear, and other emotions as they try to adapt to the changes in their relationship and expectations. Youth with mobility impairment can feel cut off from friends and former activities. Community Mental Health has five locations across the Island, including the Richmond Centre located at 1 Rochford Street in Charlottetown. They have free counseling services available. The mental health teams are established under a multi-disciplinary model with professionals from the disciplines of Nursing, Psychology, Social Work, and Psychiatry providing services at the Centre.